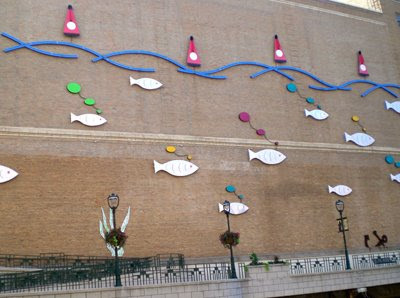 Just north of Wisconsin Avenue, on the west side of the Milwaukee River, you can find this display (sculpture, mural, artwork?) on the back side of one of the buildings. An interesting underwater scene, it comes alive at night when all the pieces are backlit with different colors.